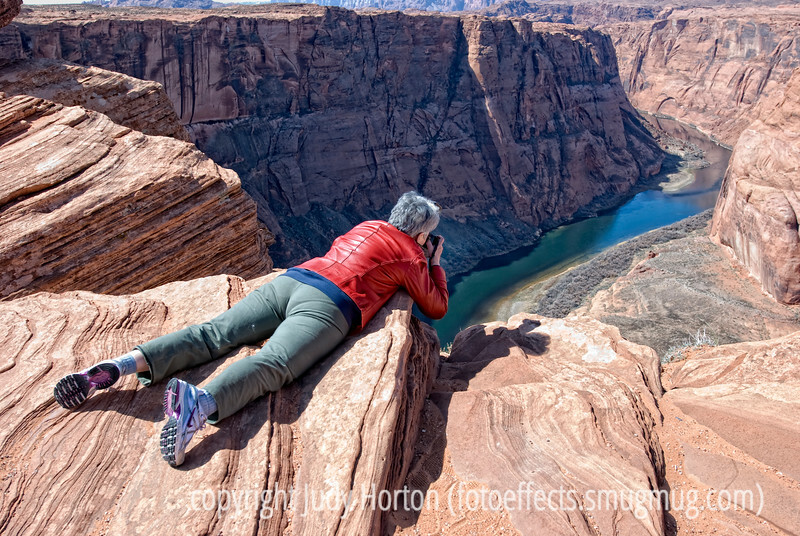 Getting the shot at Horseshoe Bend. Not my preferred view in which to be photographed. Since I am the family member who is rarely captured in photos, the reason that I was preserved for posterity in this unflattering position is that I am terrified of heights and, after hiking about 1/2 mile to reach the Horseshoe Bend Overlook, I discovered that the ONLY way to get a shot of the bend in the Colorado River here is to get out to the absolute edge of the sheer cliff dropoff. No way that I could make myself get out there in a standing position. Even then, without a fisheye lens, you would not be able to get the whole bend in the picture. Luckily, I had my fisheye lens. After walking all around the edge and confirming that they only way I could get a shot of the famous bend was to be on the edge, I lay down and inched myself out so that I could hang my camera over the edge to get some shots. The shots I got are here: http://fotoeffects.smugmug.com/Landscapes/Northern-Arizona/11896740_iVsC7#842028150_NVySM. Not fabulous and I'd like to try again on a cloudy day or at sunset. My hubby, who was holding my other camera, decided to take advantage of me (not for the first time) and took this shot. I intended to post it right after returning from the trip but other shots kept getting my nod, so I forgot this one until I ran across it this evening in my Northern Arizona gallery. Hope it gives you a chuckle! Thanks for the comments on my shot of the milkweed pod and seeds. Hope your week got off to a good start and that you are finding a few moments to take some shots. Been there and done the same!! But to help a future shot try the Voigtlander 10mm f/5.6 they make for the Sony FE mount but there are adapters for other camera (I think) or a 12mm could do it. What most do not think about is the coverage up and down - leaving the camera level you get the river below and the sky above as well as the wide side to side. this way you get a shot that looks like you can just step over to the other side. Thank you for your comments on mine. I swear, every time I see this shot Judy (and I LOVE it by the way), I am amazed at your courage. After having been there myself, I'm even more amazed. I thought of you while there a few years ago and thought I'd try to replicate this, but the butterflies in my tummy just wouldn't let me. I love that this popped up again today. and NO ONE was holding your legs??? You are braver than I am! Now that is a dedicated photographer. These shots are always difficult to get the perspective and sheer size. You have really nailed it with the guy in the foreground. Decent of him to wear a red jacket.